In the first instance, we think the Road Code should treat pedestrians as it treats other road users at intersections (mode equality). 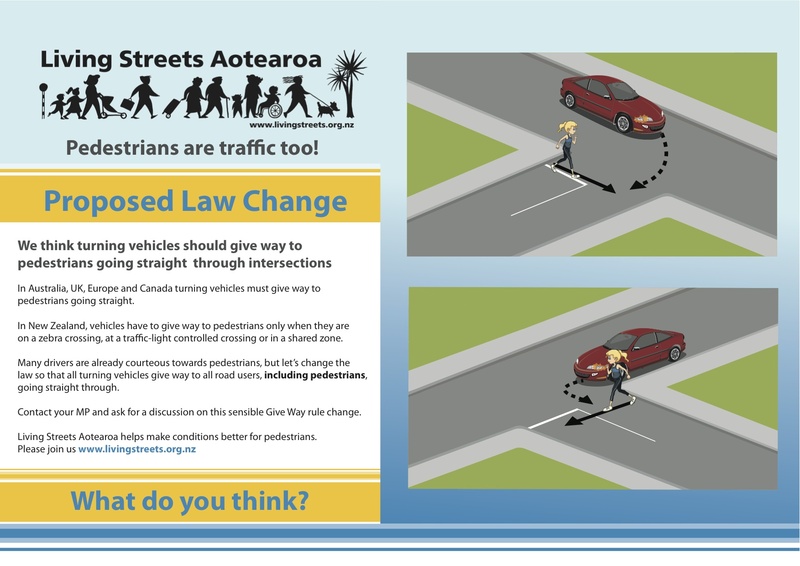 This would mean that turning vehicles would give way to pedestrians walking straight through (see the diagram below). This is already the law in Australia, Canada, the UK and the USA. Write a letter to the transport Ministers Phil Twyford, Julie Anne Genter, Shane Jones and your local MP. Write Letters to the Editor of newspapers asking for this change. Rules have changed to favour Pedestrians in France. 20 June 2012, Wellington. Andy Smith and Mike Mellor meet with Simon Bridges Assoc Transport Minister, Iain Lees-Galoway Labour Tranport MP, Automobile Association and Cycle Advocates Network. All expressed support for this campaign. Here is the ministerial briefing paper of that meeting. TV One Breakfast Show, 10 April 2012 - Andy Smith (President) talks on proposed rule changes.